Patricia Vega is a Freelance Hair & Make-Up Artist, based in Sedona, AZ. Offering National and International Services. 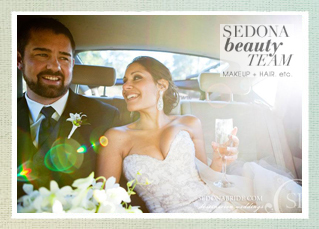 Sedona Beauty Team gives brides luxurious on-location hair and makeup services for their bridal beauty needs. Wedding professionals agree Sedona Beauty Team is THE place for one stop shopping for brides who want to look flawless, modern and romantic on their wedding day.